We're recruiting new authors! To find out how to apply, click here! Site under maintenance. We apologize for any inconvenience. The #1 QUILTBAG opinion blog on the web. We aim to open minds and help the queer community. 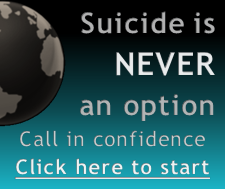 News, blogs, video, worldwide suicide prevention and more. By now you will have met Harvey Milk. You'll have heard how he grew up, how his early political career started, about his activism, and about the views on LGBT at the time. You probably know Milk as the first openly gay elected official. That's how I knew him, before I started my research for this post. Just a name, an important, almost legendary name, of course, but I think that's why initiatives like Harvey Milk Week are important. They give that name a context. 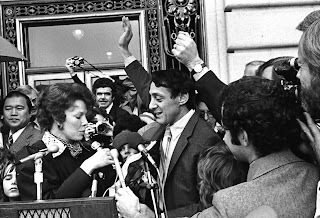 This was Harvey Milk’s statement, as he walked to City Hall with his partner, Jack Lira, just after being elected a Supervisor of San Francisco. Sworn in with Milk were candidates that were a first for the city - a single mother (Carol Ruth Silver), a Chinese American (Gordon Lau), and an African American woman (Ella Hill Hutch). Alongside them was another man - Daniel White, an ex-police officer and firefighter. Milk was not exactly a humble or predictable man, according to some. In his first meeting with Mayor George Moscone, he called himself the “number one queen”. He also told him that the gay population - estimated at a quarter of the population of the city - had to be accessed via Milk, rather than the Alice B. Toklas Memorial Democratic Club - the party headed by Stokes. He was not idle at the beginning of his tenure. He sponsored a civil rights bill that outlawed discrimination based on sexual orientation - a similar bill to the one in Dade County, Florida, which was opposed (and later repealed) by the Save Our Children campaign, led by a group of conservative fundamentalist-Christians. Out of all the supervisors on the board, only White voted against the bill. White and Milk only agreed on one issue. They both opposed the building of a mental health facility for troubled adolescents should not be placed in White’s district, which was close to the Castro. White had used his opposition of the facility extensively in his campaign to become supervisor. However, after learning more about it, Milk switched his vote to against White’s, ensuring that he lost the vote. From thereon out, White opposed every initiative and issue Milk supported. The Save the Children campaign, lead by singer Anita Bryant, was unfortunately very successful. Its first defeat only came in November of 1978, with the Briggs Initiative. John Briggs saw the turnout for the vote to repeal the anti-discrimination laws in Florida, the largest ever for the county at 70% of voters, and thought that he could monopolise that popularity in his 1978 campaign to be California Governor. He devised Proposition 6, a law that would have made it illegal to employ homosexuals in schools. Forget repealing anti-discrimination laws, this was going one step further to a pro-discrimination, even a you-must-discriminate law. At one point, there were even discussions that suggested that they should also make it mandatory to fire any teacher that was even pro-gay. Briggs was forced to drop out of his campaign, but still advocated the (worryingly popular) proposition. He campaigned throughout California to gather support. And Milk travelled across California to go head-to-head with Briggs. He attended every conference that Briggs held, and debated as thoroughly with him as possible. Briggs maintained that homosexual teachers wanted to abuse and recruit children. Milk responded with statistics compiled by law enforcement that provided evidence that paedophiles identified primarily as heterosexual, and dismissed Briggs' arguments with one-liner jokes like: "If it were true that children mimicked their teachers, you'd sure have a helluva lot more nuns running around". The Briggs Initiative was put to vote on November 7th 1978, after it gained a few high profile opponents. Governor Ronald Reagan, Governor Jerry Brown, and President Jimmy Carter all voiced their disagreement with Proposition 6. It lost by more than a million votes, and more than 75% in San Francisco voted against it. To win by such a large margin was astounding to the gay community, and it was almost undoubtedly due to Milk’s extensive efforts to publicise the side of the argument that few would have considered before - that being gay was not a “perversion”. That being gay was just another facet to someone’s character. This was the highlight of Milk’s career. On November the 10th, White resigned as Supervisor, citing his low wage as a reason. On November the 27th, the day that Mayor Moscone was going to announce a replacement, and only twenty days since Proposition 6 was rejected, Daniel White let himself in through a basement window to avoid the metal detectors, and found and shot both George Moscone and Harvey Milk. Like writing? Fancy writing posts like this about the LGBTQIA topic of your choice? Join us! We're always looking for new writers! 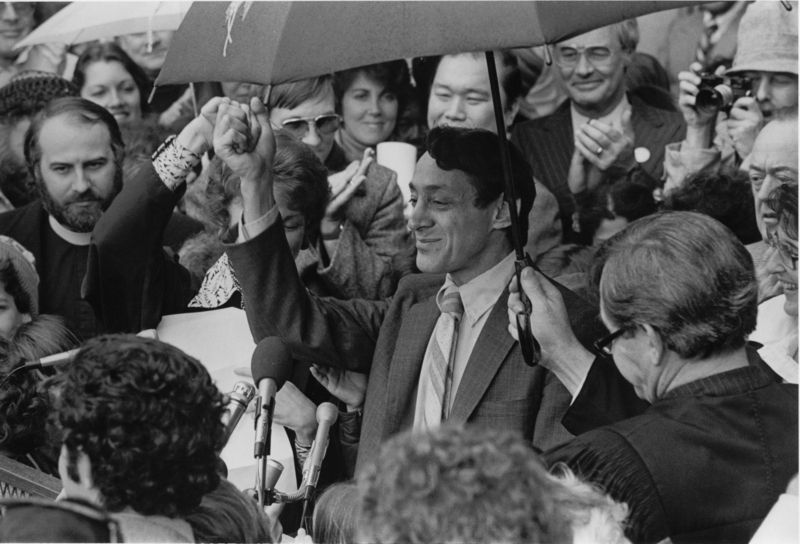 What did Harvey Milk do for us? Follow Freedom Requires Wings via email updates. You'll receive regular newsletters letting you what we've been writing about on the site. This allows you to get quick access to our latest news items, blog posts and more before anyone else.